Your comments regarding the bodies being left in situ are unwarranted. The deceased crew of the US helicopter that crashed in Norfolk, UK were also left in situ for three days, although covered, while the site was rendered safe and investigations and coroners requests were carried out. 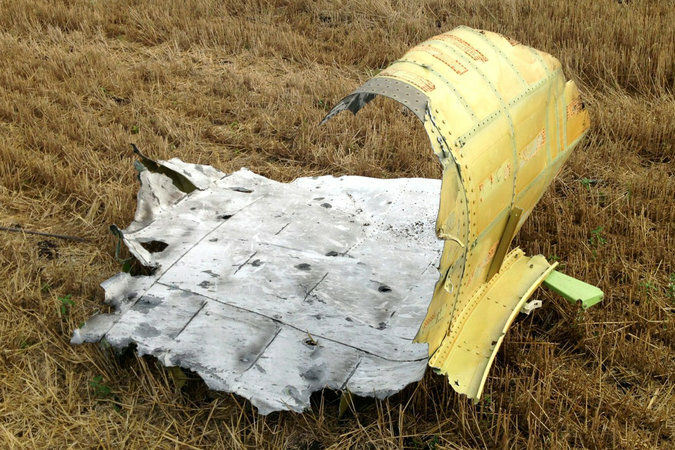 The MH17 crash site should be treated as a crime scene until whatever happened has been established. This scene is in the middle of a war zone with limited resources available to conduct any form of investigation, let alone preserve every minute detail at the scene. So leaving stuff in situ as long as possible is probably the best that can be hoped for in the circumstances. All things considered, access to the wreckage site has been remarkably open to reporters and investigators. It is unreasonable to expect Western European or US standards of scene preservation and analysis, but since it is pretty obvious what happened (in a gross sense) the minutea really doesn't matter that much. The investigators and local population are doing their best in what are very unpleasant, unstable and difficult circumstances and are to all be commended for their actions. Sorry but what is staying on topic? Pace, IMHO that is avoiding broading the topic to geopolitics, ethnity, etc. Once we know what has actually happened, we might debate contributing factors, but not the other way around. I'm not rying to moderate this board, but I recon that we are touching areas sensitive to many ppruners, and those areas are not really the primary cause of this tragedy. If you're referring to the long strips during the initial crash, cellophane wrap is so difficult to unroll. It would be very unlikely that it unraveled itself during the fall. Apologies if you're referring to another issue. Italian newpaper (Corriere Della Sera) is running a story where Russian separatists supposedly admit to them shooting down MH17 thinking that it was a military plane. I find it curious some people are so bent out of shape of the handling by the seperatists of the wreckage/bodies, terrible as it is and certainly should not be excused or go uncriticised, but get real, this is a very poor, pretty unloved part of the world, not exactly known for it's universities and Nobel lauriets..... If this had happened in some African countries, it would make this emergency response look very professional. Some people seem to be giving credit to the separatists for 'handing over' the flight recorders. Have they considered that they were vital evidence in a criminal investigation, removed from a crime scene. TV reporters have plenty of photograhs of heavy equipment moving sections of the airframe before crash investigators have arrived. Early shots show collections of passports - what else of the passengers poossessions have been collected of looted. The behaviour is all consistent with unacceptable interference by the local 'militias' whoever is directing them. The problem with the black boxes is that firstly they are not going to contain anything which will add to the facts we already know which is that the aircraft was shot down by a missile. Secondly the black boxes themselves are now suspect. Where have they been since removed? As one aviation Authority stated it is not out of the realms of reality to remove data which was unwanted and return the black boxes as in original state. I also find it amazing how the emphasis is now changing in these threads to what a great bunch these people are who shot down a civilian aircraft. I strongly suspect it was an accidental target which has turned around in a very negative way against the rebels if in fact it was the rebels who shot it down and not a direct import from Russia with 6 Russian trained troops operating it and now hastily removed. The handing over of the black boxes is not a big deal. Autopsies are likely to be more informative. Did it ever occur to you that maybe they were moving large pieces of wreckage to get to the decomposing body/parts of a person. What would you prefer, leave them under it rotting or move a piece of wreckage that has fallen 33,000ft to its random resting place. Did they lift it and take it away? You don't know and neither do I as it was only reported that they were moving wreckage and disturbing the evidence. I expect they lifted it, removed the body and then put it back. I honestly think it is quite disgraceful how this is sometimes being reported and it is obviously having the desired effect on the people who just soak it up without ever contemplating why. "As one aviation Authority stated it is not out of the realms of reality to remove data which was unwanted and return the black boxes as in original state." You must be kidding! Everyone has been apalled at the poor and unprofessional handling of the site, then some "expert" thinks these cats might decide to put down their vodka bottles and carry out a highly technical removal of data from an FDR returning it to it's original state....now that is "armchair expertise"! This picture (from the collection posted before) seems to show the "toilet paper" discussed before as seen falling from the sky in the video. It definitely is larger than toilet paper, but I have no idea what it is. thank you, been waiting to see a photo of it, certainly doesn't look like a new form of chaff (as suggest a few pages back). "In the agonizing quest to pin down exactly what happened when Malaysia Airlines Flight 17 went down over Ukraine last week, Web archivists and other digital sleuths are playing an unusual potentially pivotal role"
Re moving the bodies, provided the markers sticks have a ref number which is repeated on the body bag, it will be possible to see which part of the aircraft they were seated in. Any tampering with bodies, like removing shrapnel will be evident at autopsy. Re who did it, I think if the rebels knew it was the Ukraine forces they would have had a secure cordon in place immediately, nothing would have been touch and the experts would have been allowed and escorted for safety ASAP. They are not stupid and would not have wasted such an good propaganda opportunity. Yes we saw collections of passports and bank cards etc but how do we know at this stage they won't be handed over to the investigation team, after all they have been witnessed with them and didn't confiscate the film. Personally I believe it was a rebel c*ck up, but now their initial panic is over are they likely to make their position worse by holding on to these items, after all the pax list is known so it is easy to get the passports and cards cancelled. Hardly think that was the suggestion. If one thinks about it just a little bit one might consider that the expertise to conduct a highly technical removal of data from an FDR could be resident in Moscow (or elsewhere in Russia) No? The wreckage, photographed by two reporters for The New York Times in a field several miles from where the largest concentration of the Boeing’s debris settled, suggests that the destruction of the aircraft was caused by a supersonic missile that apparently exploded near the jet as it flew 33,000 feet above the ground, according to an analysis of the photographs by IHS Jane’s, the defense consultancy. Quick question for the experts (of which I am not). Anyone know if it is possible to ascertain whether a CVR/FDR has already been opened/analysed? I know these units are sealed to protect them from excessive trauma/heat/water ingress so would the seal effectively be broken if data had already been accessed? one might consider that the expertise to conduct a highly technical removal of data from an FDR could be resident in Moscow (or elsewhere in Russia) No? a) how to wipe the data entirely (then can blame MH pilot for turning stuff off, with handy recent example of MH370). b) that the data will tell no one anything about _who_ fired whatever took the plane down, so just hand the things over and make yourselves look good for once. Did anyone stop to think perhaps the passports were collected by locals with no knowledge other than that some of the wreck was burning and they wanted to preserve them for the authorities to help with confirming identities? Not everything must have an evil motive, it could be plain ignorance of crime scene protocol. As mentioned, many of the volunteers were miners and farmers from local towns. As for tampering with the recorders- there is a photo of a guy carrying it. You really think they're going to try do something to them with the media knowing, recording and having them down as the first people to touch it? Minutes before the crash caused by a missile strike, the AI pilots had also heard the controller give the Malaysian aircraft MH17 what is called "a direct routing".